Nab Saheb & Denys X. Arbaris. 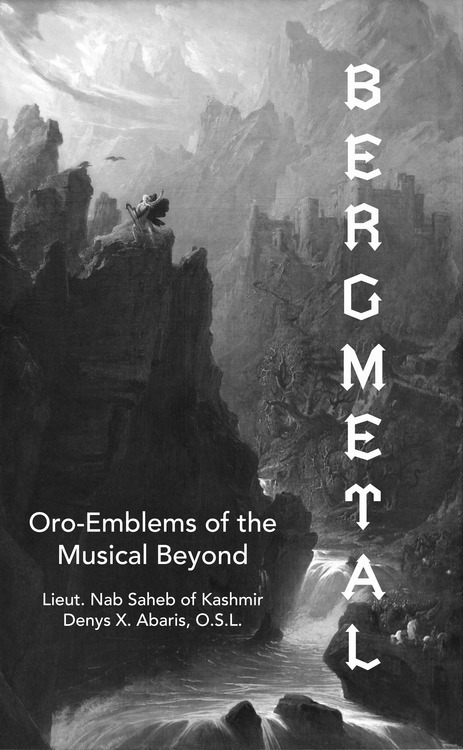 Bergmetal: Oro-Emblems of the Musical Beyond. ISBN-13: 978-1494907204 ISBN-10: 1494907208. HWORDE, 2013. 114 pages. Bergmetal is an exploratory tract on the trisonic intersections of MOUNTAINS, MYSTICISM, and HEAVY METAL. Mixing theoretical reflection and studious redaction into ascending gestures of alpine musical thought, the book proceeds via seven poetic emblems plus commentary addressing works by Bathory, Darkthrone, Sleep, Aluk Todolo, Omega Massif, Schrei aus Stein, and Sapthuran. Opening essays by the authors on the ideals and history of the bergmetal genre provide a logistical starting point and contextual basecamp. "The sailor Larsen was first to spy the jagged line of witchlike cones and pinnacles ahead, and his shouts sent everyone to the windows of the great cabined plane. Despite our speed, they were very slow in gaining prominence; hence we knew that they that they must be infinitely far off, and visible only because of their abnormal height. Little by little, however, they rose grimly into the western sky; allowing us to distinguish various bare, bleak, blackish summits, and to catch the curious sense of fantasy which they inspired as seen in the reddish antarctic light against the provocative background of iridescent ice-dust clouds. In the whole spectacle there was a persistent, pervasive hint of stupendous secrecy and potential revelation. It was as if these stark, nightmare spires marked the pylons of a frightful gateway into forbidden spheres of dream, and complex gulfs of remote time, space, and ultradimensionality. I could not help feeling that they were evil things--mountains of madness whose further slopes looked out over some accursed ultimate abyss. That seething, half-luminous cloud background held ineffable suggestions of a vague ethereal beyondness far more than terrestrially spatial, and gave appalling reminders of the utter remoteness, separateness, desolation, and aeon-long death of this untrodden and unfathomed austral world" (HPL, At the Mountains of Madness).